The market is open at 6:00 am and closes at 6:30 pm everyday. Remember that chances are, there is another shop which sells the exact same product, so don't feel you are stuck to one shop. If you are buying multiple items from one shop, or buying in a group and paying together, try bargaining down a bit more. Agree on a price before handing any money over. Due to language and cultural barriers, you may be misunderstood. Beware of pickpockets, and don't flash an excessive amount of money around. Always be friendly, as you will seem a nicer person, whether you're asking for directions or bargaining. If you have extra time on your hands, visit Pho 2000, which happens to be right across the street from the market. As one of the oldest buildings in Ho Chi Minh City, the building dates back to 1912, but the market can be traced back to the 17th century, when a number of street vendors gathered on the bank of the Bến Nghé river. This location was destroyed by a fire, and the market was moved to where it stands today in 1912. 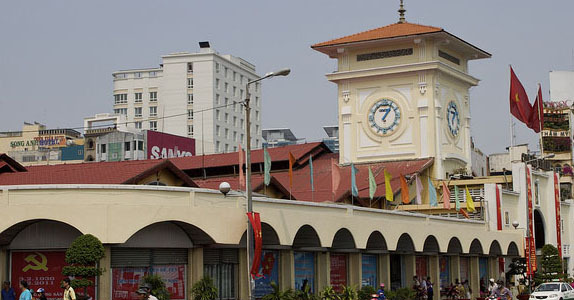 The 17th century version of the market reportedly sold more food and groceries, whereas today’s Bến Thành Market sells more souvenirs and decorations suited towards tourists. Located in District 1, the market will be on most maps, and basically all taxi drivers will know where it is. Ask your hotel for a map, and if you are not too far away, it would be a good idea to walk, as the surrounding area is quite interesting as well. Today, Ben Thanh Market is a popular spot for tourists, as there are lots of things for sale. It can be a good spot to pick up a souvenir or a present to remember your holiday. The market is sectioned up neatly, but stalls tend to overflow into the aisles. In the center, there is a food section, with stalls selling drinks and hot food. The general rule is, the busier the stall, the better the food is. The vendors are used to tourists buying from them, so the menus will be in English, and the vendors will be able to speak some English. Expect food to be slightly more expensive than the street stalls dotted around Ho Chi Minh City. An average dish will cost around 60,000 VND and a drink will cost around 20,000 VND. Although bargaining is allowed in many shops in Ho Chi Minh City and throughout Vietnam, and definitley in Ben Thanh Market. Whilst there are some shops which have a "No Bargaining" sign, chances are that the price can be haggled down a bit. When bargaining, ask for the sellers price first, then start bargaining at around 50%, and inch your price up. Remember that 50% is a guide, not a rule, so adjust accordingly depending on the item. When you are not happy with the bargain, just walk away. Chances are, if the seller hasn't got many customers, they will run after you. Just be mindful that the sellers also have to make a living, so don't be excessively harsh.